A scandal has broken out around one of the main exhibitions in the upcoming MAKS-2013 airshow — the VIP version of the Sukhoi Superjet for Rosoboronexport. The American company Aeromanagement is challenging the right to demonstrate the airplane in court, as its interior was allegedly borrowed illegally. The American company Aeromanagement, a developer and manufacturer of aviation interiors, filed a lawsuit against Sukhoi Civil Aircraft (SCAC) at the U.S. District Court for the Southern District of New York. 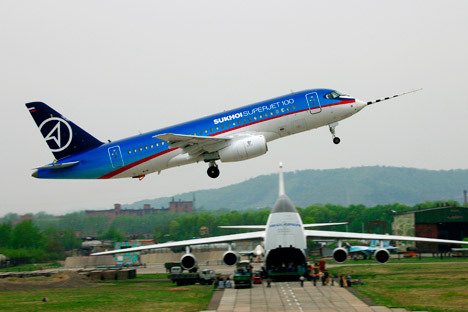 The reason for the lawsuit was the upcoming display of the Sukhoi Superjet 100 (SSJ-100) in its VIP form at the international MAKS-2013 airshow. According to court materials, the plaintiff is of the opinion that the interior of the plane is identical to the Aeromanagement design, in which case SCAC, which is a subsidiary of the United Aircraft Company, may violate intellectual property rights by revealing commercially sensitive information to third parties. SCAC signed the contract for the outfitting of the airplane for sale to Rosoboronexport (the $30-million contract must be signed at MAKS) with Aeromanagement in July 2012. The work should have cost $6.3 million. In the fall of 2012, Sukhoi Civil Aviation informed Aeromanagement that the interior must be finished in time for the MAKS-2013 airshow. In January 2013, SCAC transferred the first installment of $950,000 to the American manufacturer. In March, Aeromanagement presented the preliminary interior project proposed for showcasing at the airshow. However, it soon became clear that the model of the interior would not be completed by the beginning of the airshow. Therefore, SCAC decided to use the services of a different developer (the identity of this developer is not indicated in court materials), in order to exhibit the plane at the airshow. Alexander Pimenov, senior vice president for new programs at SCAC, explained in the proceedings materials that the company had its own plans for the interior, prior to signing the contract with Aeromanagement in June 2012: One of the options for the layout and color scheme had been presented at the July 2012 airshow in Farnborough, U.K. The conditions under which it will be possible to continue work on the contract are now being discussed. SCAC representatives declined to comment, referring to the fact that court proceedings are still in progress. The president of Aeromanagement, Irina Andriasova, only informed Kommersant that, “The parties are currently engaged in contractual relations.” As a result, the court has not forbidden exhibiting the plane, but patent litigation proceedings continue. The airplane that became the object of dispute (factory number 95009 in court materials) was intended to be the second SSJ-100 in Armavia’s flotilla; however, the airline company did not take it for financial reasons (the company ceased flights on Apr. 1). Thus, the airplane required a number of modifications. This process lasted nearly six months. The interior in the VIP model was done by Aviastar-SP in Ulyanovsk. The Rosoboronexport emblem has already been mounted on the plane. A source close to Rostec confirmed to Kommersant that the plan was to display the SSJ VIP model with the Rosoboronexport logo in the plane cabin, but it is uncertain whether the deal to buy the plane will be announced. Kommersant’s source affirms that the issue was discussed on Aug. 19, during a meeting between the head of Rosoboronexport, Anatoly Isaikin, and the president of the SCAC, Mikhail Pogosyan. The latter personally came to the customer’s office in Stromynka. Rosoboronexport is not commenting on this information. According to Vitaly Romanyuk, director general of the LLC Vemina Aviaprestige, which produces VIP interiors for airplanes, visual similarity is insufficient for challenging a project’s ownership. Talk of plagiarism only makes sense when two projects are identical by more than 30 percent and if the mock interior was patented in advance; if SCAC paid for the design project, then it has acquired it as property, noted Romanyuk.